Background and objectives Recurrent hemodialysis (HD)-induced ischemic cardiac injury (myocardial stunning) is common and associated with high ultrafiltration (UF) requirements, intradialytic hypotension, long-term loss of systolic function, increased likelihood of cardiovascular events, and death. More frequent HD regimens are associated with lower UF requirements and improved hemodynamic tolerability, improved cardiovascular outcomes, and reduced mortality compared with conventional thrice-weekly HD. This study investigated the hypothesis that modification of UF volume and rate with more frequent HD therapies would abrogate dialysis-induced myocardial stunning. Design, settings, participants, & measurements A cross-sectional study of 46 patients established on hemodialysis >3 months compared four groups receiving the current range of quotidian therapies: conventional thrice-weekly HD (CHD3); more-frequent HD five to six times/week in a center (CSD) and at home (HSD); and home nocturnal HD (HN). Serial echocardiography quantitatively assessed regional systolic function to identify intradialytic left ventricular regional wall motion abnormalities (RWMAs). Cardiac troponin T (cTnT), N-terminal prohormone brain natriuretic peptide (NT-proBNP), and inflammatory markers were quantified. Results More frequent HD regimens were associated with lower UF volumes and rates compared with CHD3. Intradialytic fall in systolic BP was reduced in CSD and HSD groups and abolished in HN group. Mean RWMAs per patient reduced with increasing dialysis intensity (CHD3 > CSD > HSD > HN). Home-based groups demonstrated lower high-sensitivity C-reative protein levels, with trends to lower cTnT and NT-proBNP levels in the more frequent groups. Conclusions Frequent HD regimes are associated with less dialysis-induced myocardial stunning compared with conventional HD. This may contribute to improved outcomes associated with frequent HD therapies. Cardiovascular mortality in hemodialysis (HD) patients is grossly elevated (1) and not fully explained by traditional risk factors. Sudden death is the commonest cause, followed by heart failure (1). Vascular calcification (2), microcirculatory dysfunction (3), impaired coronary flow reserve (4), ineffective vasoregulation during HD, and ultrafiltration (UF) (5) contribute to cardiovascular morbidity and predispose patients to demand myocardial ischemia. It is becoming clear that processes relating to the dialysis procedure itself are implicated. In the nonuraemic population, recurrent myocardial stunning (resulting from coronary artery disease) contributes to development and progression of myocardial injury resulting in heart failure (6,7). Studies have demonstrated that standard HD induces global and segmental cardiac ischemia (8,9). Two-thirds of patients suffer from recurrent HD-induced ischemic injury (10). This is associated with impaired hemodynamic response to dialysis, significant elevations in cardiac troponin T (cTnT, a marker of cardiac cell damage), reductions in both segmental and global contractile function, and elevated mortality risk (10). Previous short-term studies of alterations to HD therapy to improve hemodynamic tolerability have been shown to abrogate this injury (5,11). Key modifiable determinants (UF) of HD-induced myocardial stunning are ultrafiltration volume (and hence rate) and intradialytic drop in BP (10). Daily dialysis therapies are characterized by reduced UF requirements within each dialysis session, with improved treatment tolerability. This results in advantageous effects on cardiovascular structure and function, with potentially improved survival (12). Current data suggest that frequent nocturnal HD is associated with maximal benefit (12,13). We aimed to investigate whether more frequent dialysis regimes were associated with reduction in dialysis-induced cardiac injury incidence and severity. Furthermore, we aimed to compare the acute hemodynamic effects of the current range of commonly utilized more frequent dialysis schedules. Forty-six established patients receiving HD from a single provider based in Northern California were recruited to a cross-sectional observational study. The patients were selected from four groups according to HD modality: conventional thrice-weekly in-center hemodialysis (CHD3, 12 patients); short-daily hemodialysis (CSD) in-center five or more times per week (12 patients); at home five or more times per week (HSD, 12 patients); and nocturnal dialysis at home five or more times per week (HN, 10 patients). CHD3 and CSD patients were matched where possible according to age, gender, diabetes, and dialysis vintage. Patients over 18 years of age established on their current HD modality for at least three months were eligible to participate. Patients were excluded if they had pre-existing severe left ventricle (LV) systolic dysfunction (New York Heart Association classification, stage IV), had received a cardiac transplant, or had inadequate echocardiographic windows to obtain images of sufficient quality for analysis. Thrice-weekly in-center patients were studied after a short interdialytic interval. Patients receiving more frequent dialysis regimens were considered adequately dialyzed at all times, and studies were performed during a routine dialysis treatment. HN patients refrained from dialysis the night before the study. HD for the in-center patients was performed with Fresenius 2008K monitors, using bicarbonate dialysate (Na+, 138 mmol/L; K+, 1.0 to 3.0 mmol/L; Ca2+, 1.25 mmol/L; acetate, 3.00 mmol/L; Cl−, 107.5 mmol/L; HCO3−, 32.0 mmol/L (variable); and glucose, 2.0 g/L). HSD patients performed their HD treatment at a dialysis clinic to facilitate the study procedures. Dialysis was carried out according to the treatment parameters, blood flows, and fluid removal normally used at home to replicate their home dialysis treatment as closely as possible. To enable study of the HN patients during the working day, their dialysis treatment time was reduced to six hours. HD was performed with NxStage System One machines: lactate dialysate, 40 to 45 mmol/L; Na+, 140 mmol/L; K+, and 2 to 3 mmol/L (variable) and polyether sulfone dialyzers. The study was conducted according to the Declaration of Helsinki. Ethical approval was granted by Aspire IRB (La Mesa, CA). Informed consent was obtained from all of the patients. The patients were assessed to evaluate the presence and extent of HD-induced regional wall motion abnormalities (RWMAs). Two-dimensional echocardiography was performed before dialysis (“pre-HD”), 15 minutes before the end of dialysis (“peak stress”), and 15 to 30 minutes after the end of the treatment (“recovery”) (1.5 to 3.6 MHz 3S probe; GE Medical Systems). Apical two-chamber and four-chamber views were digitally recorded for subsequent analysis (Echo-CMS; MEDIS), as described previously (14). Three consecutive heartbeats were analyzed for each time point. Endocardial borders were traced semiautomatically for each frame of the three-beat sequence. Anomalies were corrected manually. Maximal displacement of the endocardial border from a center point was measured over 100 chords around the wall of the LV, corrected for end-diastolic LV circumference, and expressed as a percentage of shortening fraction (%SF). Each apical view was divided into five segments, and %SF for the chords in each segment was averaged so that ten regions of the LV were assessed at each time. New RWMAs were classified as segments showing a decline in %SF >20% from baseline. Ejection fraction was calculated using the biplane disc method. Noninvasive BP was measured (TM2910 monitor; A+D Medical) at the brachial artery on the nonfistula arm. Predialysis BP measurements were taken after the patients had been resting for 5 minutes. The subsequent measurements were taken at the same time points as the echocardiography (15 minutes before the end of dialysis and 15 to 30 minutes postdialysis). For the peak stress and recovery measurements, the appropriate body weight was calculated by subtracting the UF volume removed (calculated from the programmed UF volume and rate) from the baseline weight. The weight achieved at the peak stress measurements was taken as the target (dry) weight for the purpose of analysis. Blood was collected in lithium-heparin tubes. Predialysis blood was drawn immediately after insertion of the access needles or permcath connection to the dialysis lines. Postdialysis blood was drawn 3 minutes after the end of the dialysis treatment. The samples were immediately centrifuged for 15 minutes at 10,000 rpm to separate the plasma. Plasma for biomarker assessment was immediately frozen; plasma for biochemical analysis was refrigerated and tested within 24 hours. Electrolytes (Na+, K+, Cl−, and HCO3−) and standard biochemical parameters (urea, hemoglobin, calcium, phosphate, parathyroid hormone, albumin, ferritin, and glucose) were measured using a multi-channel autoanalyzer. cTnT and N-terminal prohormone brain natriuretic peptide (NT-proBNP) were measured by third-generation electrochemiluminescence assay with the E170 immunoassay analyzer (Roche Diagnostics). High-sensitivity C-reative protein (hsCRP) and IL-6 were quantified using commercially available enzyme-linked immunosorbent assays according to the manufacturer's instructions. The primary endpoint was to measure differences in extent and severity of dialysis-induced RWMAs between HD modalities. Secondary endpoints included detailed characterization of hemodynamic response to the different HD modalities, quantification of humoral markers of inflammation, cardiac injury and circulatory stress, and comparison of other biochemical measures between modalities. Previous interventional studies using biofeedback dialysis and cooled dialysate have measured improvements in global (percentage of ejection fraction) and regional (%SF) LV function during HD (5,11). Power calculations were based on previously detecting a significant difference in number and severity of RWMAs in eight patients. Using an SD on change in fractional shortening of 0.15, a sample size of nine would appear to be sufficient to detect a difference of 20%, whereas a sample size of 12 would appear to be sufficient to detect a difference of 17%. In the previous studies, a difference of greater than 23% was observed. With a sample size of 12 patients in each group, using the primary outcome of regional left ventricular function in each of the 10 regions for each patient, there will be a total sample of 120 independent measurements of regional LV function. The results are presented as the means ± SD or the median and interquartile range depending on normality of data. Depending on Gaussian distribution, comparisons between groups were done using unpaired t tests or the Mann-Whitney test. The correlations were Pearson or Spearman, depending on normality of the data. These data are summarized in Table 1. The four groups were well-matched by age, dialysis vintage, and prevalence of ischemic heart disease. The proportion of male patients was greater in the home groups. The prevalence of diabetes was higher in the in-center groups. Mean duration of HD treatment was 204 ± 25 minutes for CHD3, 142 ± 28 minutes for CSD, 209 ± 36 minutes for HSD, and 467 ± 53 minutes for HN. Mean UF volume was 4.1 ± 1.4 L in the CHD3 group, versus 2.6 ± 0.8 L for CSD, 1.0 ± 0.7 L for HSD, and 1.1 ± 1.2 L for HN (Figure 1A). Mean UF rate was 15.4 ± 2.11 ml/kg per hour for CHD3, 13.5 ± 8.5 ml/kg per hour for CSD, 3.39 ± 2.19 ml/kg per hour for HSD, and 0.64 ± 3.72 ml/kg per hour for HN (Figure 1B). Ultrafiltration characteristics and regional wall motion abnormalities. (A) Mean ± SD UF volume, by dialysis modality. CHD3 versus CSD, P = 0.003; CHD3 versus HSD, HN, P < 0.001; CSD versus HN, P = 0.001. (B) Mean ± SD UF rate, by dialysis modality. CHD3 versus HSD, HN, P < 0.001; CSD versus HN, P < 0.001; HSD versus HN, P = 0.043. (C) Mean ± SD number of peak stress RWMAs, by dialysis modality. CHD3 versus HSD, P = 0.008; CHD3 versus HN, P = 0.019; CSD versus HN, P = 0.037. (D) Correlation between number of peak stress RWMAs and UF rate. r = 0.41, P = 0.005. There was no difference in resting ejection fraction between groups (Table 1). The proportion of patients with myocardial stunning was strongly related to the intensity of dialysis. Twelve (100%) patients in the CHD3 group exhibited HD-induced myocardial stunning, compared with 11 (92%) in CSD, 9 (75%) in HSD and 5 (50%) in HN. Overall, the mean number of RWMAs per patient was 4.5 ± 1.3 for diabetics, and 3.6 ± 1.9 for nondiabetics, which was not statistically different. There was no relationship between the number of RWMAs and chronological age or dialysis vintage. The mean number of RWMAs per patient was significantly higher for the in-center groups (CHD3, 4.8 ± 1.3; CSD, 4.6 ± 1.6; HSD, 3.3 ± 1.7; and HN, 3.0 ± 1.6) (Figure 1C). There was a strong positive correlation between the number of RWMAs and UF rate (r = 0.41, P = 0.005) (Figure 1D). The use of antihypertensive medications per group is shown in Table 1. Systolic, diastolic, and mean arterial BP measured predialysis, at peak stress, and postdialysis are summarized in Table 2. The difference in BP change between predialysis and peak stress was highly significant between groups. BP was well-maintained in the home groups, in contrast to significant relative intradialytic hypotension in the in-center groups (Figure 2). Change in systolic BP correlated strongly with UF volume (r = 0.60, P < 0.0001) and UF rate (r = 0.56, P < 0.0001). Change in systolic BP (predialysis to peak stress). Predialysis IL-6 and hsCRP were highly significantly correlated (r = 0.536, P = 0.0003). Home HD (HSD and HN) was associated with lower hsCRP levels than in-center (CSD versus HN, P = 0.018) (Figure 3A). Predialysis IL-6 did not differ significantly between groups (CHD3, 11.9 ± 18.3; CSD, 6.6 ± 5.4; HSD, 6.6 ± 6.8; and HN, 8.7 ± 6.8 pg/ml). Markers of inflammation, cardiac damage, and congestion, by group. (A) Predialysis hsCRP levels by group. CSD versus HN, P = 0.018. (B) Predialysis cardiac troponin T levels by group. (C) Predialysis NT-proBNP levels by group. Predialysis NT-proBNP and cTnT were significantly correlated (r = 0.387, P = 0.029). There was a trend to lower predialysis cTnT levels in the home groups compared with the in-center groups, although this did not reach statistical significance (CHD3 versus HN, P = 0.157; Figure 3B). Predialysis NT-proBNP was lower in the home groups compared with the in-center groups (CHD3 versus HSD, P = 0.012; CSD versus HSD, P = 0.04) (Figure 3C). This study demonstrates that compared with standard thrice-weekly hemodialysis, more frequent HD regimes are associated both with significant reductions in UF volume and rate and with abrogation of intradialytic hypotension. Furthermore, it is apparent that modification of these factors is associated with significant reductions in the occurrence of dialysis-induced myocardial stunning. More-frequent home-based therapies are associated with lower levels of markers for inflammation, myocardial cellular damage, and congestion. All of the above factors have been previously described as influencing survival in chronic HD patients. Matching for baseline characteristics was attempted between the in-center groups; prospectively matching all four groups was not practicable because of the relatively small number of more-frequent HD patients. In spite of this, the four patient groups were well-matched for chronological age (a critical determinant of stunning), dialysis vintage (a measure of the potential exposure to recurrent dialysis-induced cardiac injury and the attendant sequelae), the occurrence of ischemic heart disease, and baseline resting systolic function. Diabetes was more prevalent among the in-center patients compared with those based at home. However, in the previously published characterization of dialysis-induced myocardial stunning, diabetes was not identified as a significant risk factor (10). In this study, there was no significant difference in the number of RWMAs between diabetic and nondiabetic patients. Patients in the CSD group were originally transferred from standard thrice-weekly dialysis largely as a result of their large interdialytic weight gains and intradialytic BP instability and not because of heart failure per se. This group of in-center more frequently-dialyzed patients was a self-selected group of patients with such large UF requirements that conventional treatment had proven intolerable. There was a strong correlation between UF volume and intradialytic hypotension. The UF volume was markedly higher in the CHD3 group compared with the other three groups. Although the mean UF volume was lower for CSD than for CHD3, both groups were characterized by relatively high UF volumes in excess of those shown previously to be associated with stunning (2.1 L in the stunning group versus 1.6 L in the nonstunning group) (10). 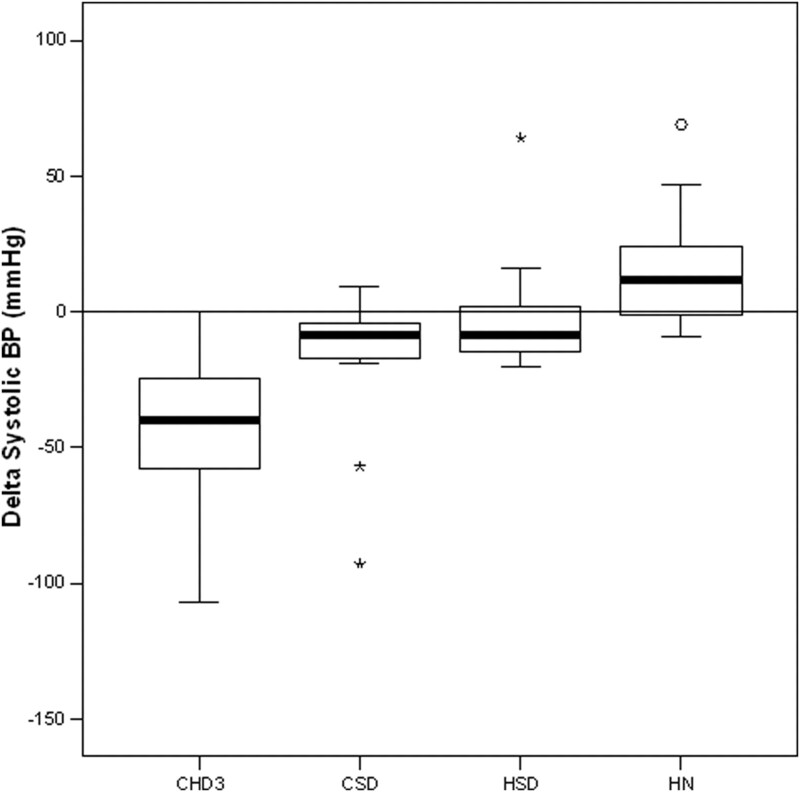 The mean interdialytic weight gain in the conventional HD group was almost twice that reported in our previous studies; this may well explain the higher prevalence (100%) of dialysis-induced cardiac injury in this population compared with previously reported data from UK-based thrice-weekly dialyzed patients. In a previous study, we reported that children undergoing similar dialysis schedules with very large relative UF requirements also exhibit almost universal dialysis-induced cardiac injury (15). The prevalence of myocardial stunning reduced with increasing intensity (frequency and duration) of hemodialysis, and there was a strong positive relationship between UF rate and severity of stunning as measured by the number of RWMAs. It is likely that there is a UF rate threshold effect for each individual patient, such that a UF rate above the threshold significantly increases the risk of stunning. Indeed, the effect of UF volume (and hence rate) has previously been shown to follow an exponential pattern, with higher UF volumes resulting in vastly increased odds of stunning (10). The study was not powered to detect differences in biomarkers of inflammation, cardiac damage, or congestion. However, the trends toward lower levels of both hsCRP and cTnT in the home-based, more-frequent dialysis groups are striking. We have recently identified a link between stunning and inflammation, as evidenced by higher levels of IL-6 in patients exhibiting myocardial stunning (16). Levels of predialysis cTnT have previously been shown to predict the risk of stunning (10). We have also observed significantly lower levels of cTnT in a study comparing patients undergoing home HD against conventional HD, who were matched for age, gender, diabetes status, and dialysis vintage (17). It is apposite to note that more frequent hemodialysis regimes have been associated with lower mortality and hospitalization days compared with standard thrice-weekly HD (18,19). Recent data have suggested that nocturnal HD may possess an additional survival benefit compared with short daily HD (12). The observed differences in dialysis-induced myocardial stunning may be the crucial differentiating factor mediating potential survival benefits of these various therapies. Previous studies of daily dialysis have largely included patients who have transferred from conventional therapy. We have demonstrated that a reduction in fixed systolic function occurs after only 12 months of recurrent cardiac injury. It is unlikely, therefore, that the optimal cardioprotective effects of more frequent dialysis regimes will be realized without the study of incident patients. Whether or not there is the potential to remodel potentially hibernated myocardium by subsequent introduction of less traumatic dialysis therapy is currently unknown but is the subject of ongoing study. This observational single-session study has a number of limitations. A direct causal link between UF reduction and lower stunning occurrence cannot be concluded from these data. The number of patients per group was relatively small, although importantly the assumptions for the sample size calculation for the primary outcome measure were met. This was not intended to be a trial of more frequent HD regimes; rather it utilized the range of therapies as a tool to study myocardial stunning in a range of HD settings. Randomized controlled trials are currently underway to examine the mortality associated with quotidian HD prospectively. This study demonstrates for the first time that more frequent HD regimes are associated with less myocardial stunning compared with conventional HD. We hypothesize that this could be an important component of the improved outcomes associated with this class of therapies. Further investigation is required to elucidate whether our observed reductions in stunning with quotidian therapies is also associated with improved longer-term outcomes. A prospective follow-up study of the effects of conversion from conventional HD to more frequent regimes on myocardial stunning is currently underway. We are grateful to the staff and patients of Satellite Dialysis and WellBound (Mountain View, CA) for their participation in the study.